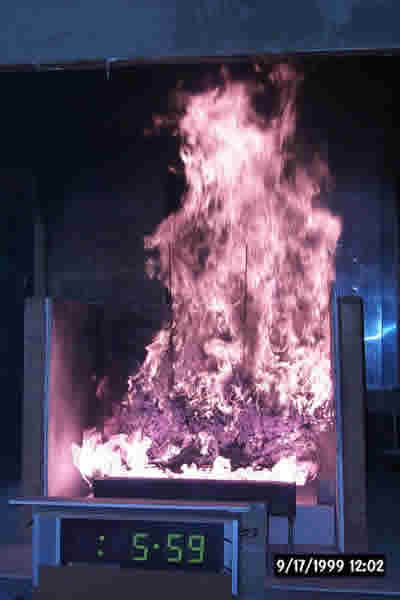 While plants close to a building can be a major fire hazard, those farther away can also serve as buffers against radiation and convective heat, and fire brands. Trees, in particular, can block many of these hazards by diverting wind flow away from the house. These townhouses in a rim location were protected by the trees at the rim edge. 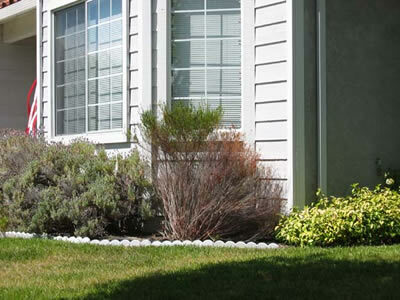 Plants against combustible siding present the greatest hazard since their flames make direct contact with the siding and can cause vertical flamespread. As the separation from plants to building increases, then we are concerned about the radiant energy from combustion (like the heat generated from a fireplace). There is a very large difference in the amount of radiant energy felt by the siding as the distance increases, for example, the same plant 4 feet away as compared to 1 foot would only have about 10% of the radiant effect on the siding. All plants within the “home zone” should be assessed using the four key criteria: size, location, structure, and condition. Size and location: These effects go together. 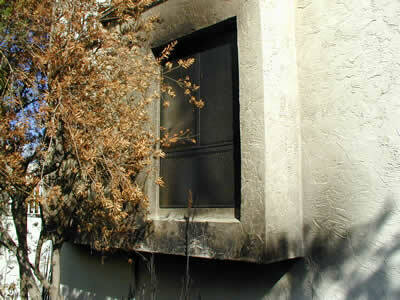 A small plant (about 2-feet high) against combustible siding under a window or at an inside corner is a real threat. A plant just under or next to a window is a primary concern. 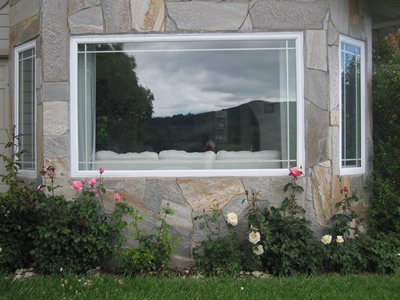 A typical window will last about 1 to 3 minutes when exposed to fire. Another bad place is an inside corner of a building, which can be ignited much more easily than simply the side of a house. Structure: Plants with a lot of fine materials, such as junipers or cedars ignite easily and can release a lot of heat in a short period of time. 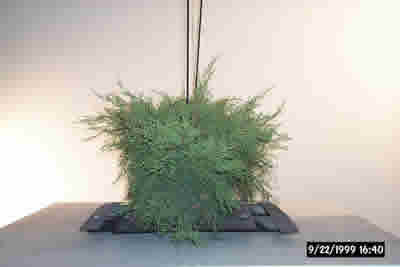 For example, the 1-foot juniper below generated 10-foot flames, which in many cases can reach up to the eaves. Condition: Dead material in or under plants can add substantially to the dry fuel, which in the fire season can be a formula for disaster. Size and location: The smaller the better, especially close to combustible siding, under a window, or at a inside corner. Better still, consider using ground cover wherever possible next to combustible siding or near windows for any type of siding. Structure: Look for “leggy” plants with succulent leaves. For example, plants similar to oleander are a good choice, as are roses. Condition: Any plants near a house should be pruned, regularly watered (preferably dripped) and any dead material removed, including at the soil level. Along with these precautions, don’t use bark or other combustible natural materials as plant bedding. Embers can land in this, smolder, and later go into flaming combustion. The burned cedars in these photos had all of the wrong characteristics! 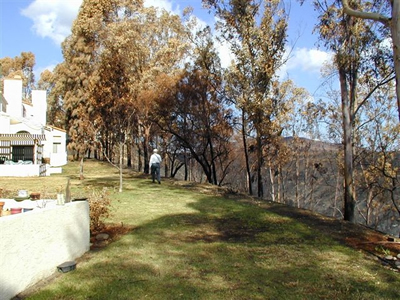 The picture shows one green cedar (far right) and one scorched (center). 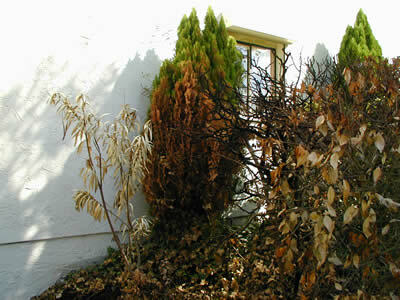 This picture is over to the right of the same side of the house where the scorching of the area around the window is evident from a cedar just below the window. A fire crew arrived just in time!